Tim Webb is looking forward to stepping down as artistic director of Oily Cart, the pioneering children’s theatre company he set up 37 years ago with Claire de Loon and Max Reinhardt. He has a grandson to play with and an allotment to tend to, but he admits he finds it hard to let go. Webb is talking to me during rehearsals for Splish Splash, one of his and Reinhardt’s final shows with the company before they retire this autumn (De Loon stepped down at the end of 2016). The director’s passion for what he does is clear. He is full of praise for the performers – all four of whom are new to Oily Cart – laughs and jokes with Sierra Leonean musician George Panda – a veteran of the company – and takes delight in showing off the intricacies of designer Jens Cole’s set as it bobs merrily around the hydrotherapy pool at the south-west London special school where rehearsals are taking place. It is not a standard rehearsal process. But an Oily Cart show is not a standard show. The company makes work for three distinct audiences – children, babies, and young people with profound and multiple learning disabilities (PMLD) or an autism spectrum disorder (ASD). 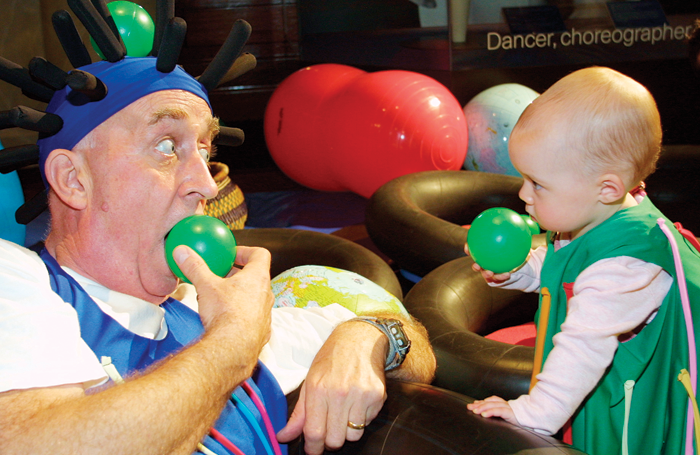 In shows for PMLD and ASD audiences, their presence is a crucial part of the shows’ development. It’s only by having the young people in the room – or, in the case of Splish Splash, in the pool – that the performers can learn to be truly responsive to them within the structure of the show. Webb likens the performances to jazz musicians improvising within the confines of tightly written arrangements – he cites jazz greats including Charles Mingus and Miles Davis as a major influence. “It’s a dangerous game you’re playing, but it’s a great one,” he says. The audience has been the focus from day one for Webb. Oily Cart – the name was a play on the D’Oyly Carte Opera Company – began life as an informal partnership when Webb and co-founder Reinhardt, the company’s musical director, started touring a Punch and Judy show. It was 1981, Webb did the puppets and Reinhardt played guitar out front. They were getting plenty of bookings and having fun but were concerned about the make-up of their audiences. So Webb and Reinhardt, along with head of design De Loon, who is married to Webb, created their first show for three to five-year-olds, Out of Their Tree, on a budget of £40. Playing to libraries, playgroups and the occasional arts centre, the show was enough of a success that Webb and Reinhardt decided to dedicate themselves to Oily Cart full-time, with De Loon doing “proper jobs” on the side to keep them solvent. 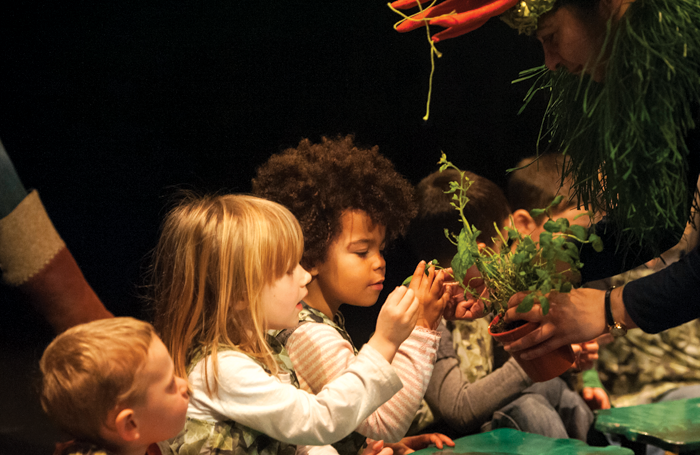 The following few years saw the company create more shows for the under-fives – “we were responding to an audience that we’d sort of discovered” – as well as expanding the repertoire to cater to seven to 11 year olds. The work for older children, then as now, features more complex narratives, but the Oily Cart playbook is the same whatever the age group: strong visuals, live music and eccentric characters. It’s always witty, considered theatre that doesn’t talk down to its audience. In 1984, it was awarded a grant from the Greater London Council. It meant Oily Cart could hire a third performer and it deliberately went for a black woman, actor Fay Roach. This way of thinking came naturally, Webb says, thanks to years spent working in the theatre in education and youth theatre sectors. Webb’s first job in theatre, as assistant stage manager at the Citizens Theatre, Glasgow, involved the venue’s TiE company. It was also here, incidentally, that he and De Loon got together – she was a designer at the venue. Webb’s role at the Citizens led to work with various TIE companies in London and, after a stint as assistant director at the Victoria Theatre, Stoke-on-Trent – now the New Vic Theatre, Newcastle-under-Lyme – Webb wound up at the Battersea Arts Centre, running its youth theatre one day a week. It was there that he met Reinhardt, who was also working in arts education at BAC. Work continued apace after the GLC grant until the next major change came about for Oily Cart in the late 1980s, when the headteacher of a special school approached Webb about performing one of the company’s early-years shows to its pupils. “That really blew our minds because we couldn’t imagine there was something that we had carefully prepared for under-fives that could possibly be right for 19 year olds,” Webb recalls. The headteacher invited them to come in and play with the children and young people in the name of research. The experience proved “revelatory”, he says. The show that came out of that research, Box of Socks in 1988, was also the first in which Oily Cart began really pushing against theatrical conventions. The performance lasted an entire day, with a trio of aliens crash-landing at the school in the morning and wandering around interacting with the students, who were empowered by being able to explain elements of human behaviour to them. “Some of the guys need more time to process the data,” says Webb, adding that the most successful examples of the company’s work at special schools have been those in which performers were embedded for even longer periods than the usual one or two-day performances. When Oily Cart did Blue at the Manchester International Festival in 2007, for example, pupils coming to see the show would spend a week beforehand with one of the characters, who had appeared out of nowhere one morning in a specially constructed American Deep South-style shack in their playground. For the first few years of performing in special schools, Oily Cart would aim its shows at children and young people across a range of abilities, with different bits appealing to different groups. 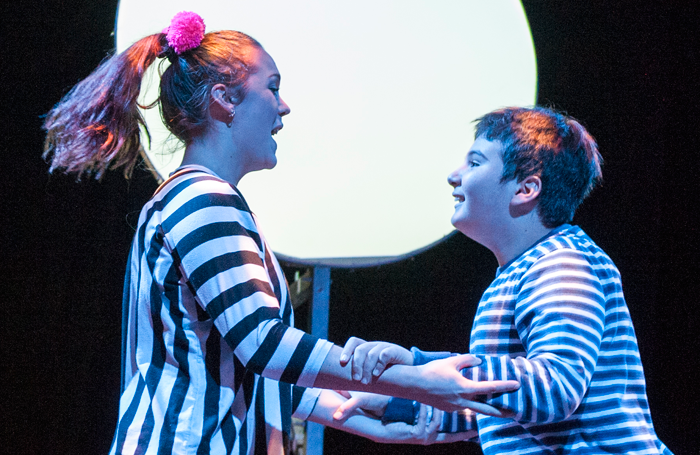 Increasingly, however, Webb became interested in creating theatre with the most hard-to-reach students in mind – those with profound and multiple learning disabilities – and since 1996 Oily Cart’s special school work has focused on this group. 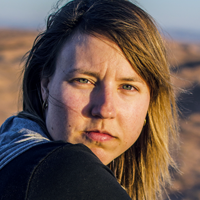 Work for young people with an ASD was added to the roster for the first time in 2004. How do you make theatre for someone who can’t remember what happened at the beginning and is not anticipating the end? Barman (when they introduced decimalisation). Assistant stage manager at Glasgow Citizens Theatre. Scen:se, a PMLD show in Sweden. That it would take a long time. One of the jazzers. I was always very taken with the sort of freedom there was in Charles Mingus’ band or Miles Davis’ band. I used to like the acting, but I didn’t like the touring much. The devil, he says, is in the detail. “Not only do things need to look right and sound right and be timed right, but they might have to smell right and they might have to be the right texture, the right temperature,” he adds. By way of illustration, Webb pulls a floating treasure chest to the side of the pool and points out a tube through which cool air will be blown on to audience members’ faces during performances of Splish Splash. The theatre Webb makes with the team at Oily Cart may not look like most of the work seen at theatres across the land, but Webb has never been too fussed about convention. Growing up in Stoke-on-Trent, he was a regular at the Victoria Theatre, where Stephen Joseph had found a permanent base for Studio Theatre, his pioneering in-the-round company, in 1962. Webb’s innovative approach certainly pays dividends in terms of the impact of the work on its audiences, with young people regularly responding and communicating in ways that surprise their parents, teachers and carers: children on the autistic spectrum who would normally be afraid to speak to strangers engaging with cast members; young people who had been mute for months vocalising along with the music. “Under the pressure of exposure to a show, kids were throwing up very unusual behaviour compared with their normal everyday life,” he says. Oily Cart received its first Arts Council England revenue funding in 1990 and has been funded by the body ever since. Getting that first grant was a “big moment”, says Webb. Having the cash to hire an administrator meant that he, Reinhardt and De Loon “could concentrate on the fun, creativity and imagination as somebody was giving us all the support we needed”. This freedom gave them the chance to really innovate, from developing that crucial work for young people with PMLD to ambitious collaborations with the likes of aerial company Ockham’s Razor, and from making theatre for under-twos to touring internationally. At the same time, he’s disappointed by the attitude of some companies, in receipt of public subsidy, when it comes to fulfilling the obligations that come with that funding – for example theatres that won’t programme Oily Cart’s shows because of Webb’s insistence on high performer-to-audience ratios. Bounce (2014). Rachel Bird with a young audience member on the autism spectrum. Photo: Neal Houghton. The director may be passing the Oily Cart baton to the next generation of theatremakers but he certainly won’t be idle after he steps down as artistic director in the autumn. Freelance projects that will keep Webb away from his allotment include a PMLD show in Sweden with the Splish Splash choreographer, Debbie Bandara, and a trip through the south-eastern states of the US that will be part holiday, part teaching and part scoping out the territory for future Oily Cart tours. 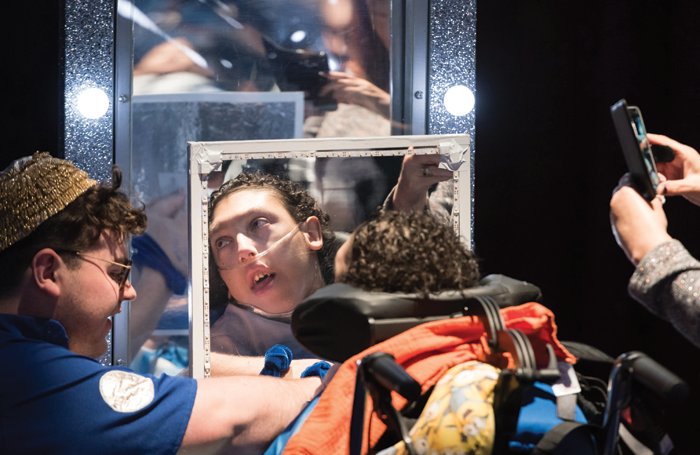 Theatre for young audiences and for audiences with complex disabilities is better understood and more widely valued today than it ever has been, and that has a lot to do with what Webb has achieved over the past 40 years. But there’s still a big disconnect between the effect of this work on its audiences and the seriousness with which it’s taken.